Add ethernet connectivity your projects, get started with the Microchip Ethernet Starter Kit quickly. This guide shows how to setup the MPLABX development environment for compiling PIC32 source code and the TCP/IP stack. Control up to 8 devices by this easy constructable remote control. It can work as a radio or infrared remote control, depending on the components. Each device output can be configured to be momentary (turned on while you press the button) or latched. Latched outputs can be toggled on/off by one button per channel, or turned on and off by two buttons per channel. Take your existing remote control and control everything with it. This receiver can learn codes from an RC-5 or NEC format IR remote control, and associate the buttons to different channels and actions. Operate your gate or something different by this simple electronic combination lock. The combination can have a chosen length of numbers or alphabets, and can be changed any time. 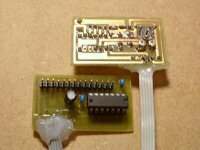 The LCD display is optional, the circuit works fine without it. After entering the correct combination, a relay is operated for the predefined time. Add general purpose input/output lines to your computer based or openwrt projects! You can control 12 digital input/output lines from USB port using this circuit. 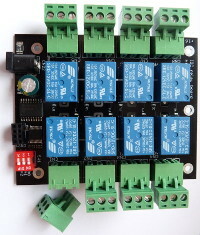 Each line can be individually set to an input or output, and each output pin can be set HIGH or LOW independently, without changing other output pin states. Build your own temperature meter for fun. 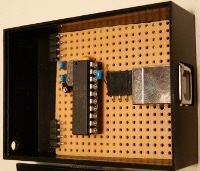 This project uses the Microchip TC77 digital temperature sensor, a PIC16F871 microcontroller and a 7-segment 3½ digit LCD. You can study the source code on how to drive an LCD display. Automatically turn off the lights after 10 minutes. If you often forget to turn off the lights outside or at different places in the house, this circuit can be practical for you. It can control two independent light switches with different turn off times. Press the button once and the light turns on for the preset time. Press again, and the light remains on forever. Press for the third time, and the light turns off. Control all your devices from the PC. This infrared remote control transmitter can be controlled from a computer. It speaks many different remote control formats, like the Philips RC-5 standard and can be tailored to other specific types. Turn on the sprinkler or the aquarium lighting for the same period of the day. You can choose to operate the output by every 2nd, 3rd, ... day only. There is a manual start/stop button to immediately turn on or off the output, and a disable button to completely turn off automatic operation. Connect an LCD to your microcontroller to make it easy to develop and debug your application. You can choose which PIC I/O pins you want to use for the interface, and any HD44780 compatible LCD can be controlled. Connect your PIC devices on a shared network, and they can communicate to each other and share information. You can control them all by any unit on the network. Are you new to microcontrollers? Microchip 8-bit PIC microcontrollers are cheap and easy to start with. You can find them in many size starting at 6 pins. Most parts contain FLASH program memory, so they can be programmed hundred times. A good choice to start with is the 40-pin PIC16F887, or the 18-pin PIC16F628A/PIC16F818. They contain integrated serial interface, timers, PWM module, AD converter and separate EEPROM to store your own data.